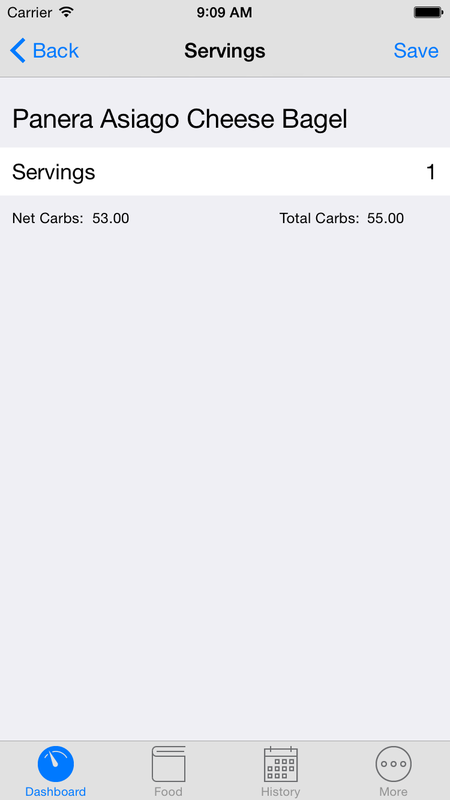 Free Carb Counting App - Carbs to Go! 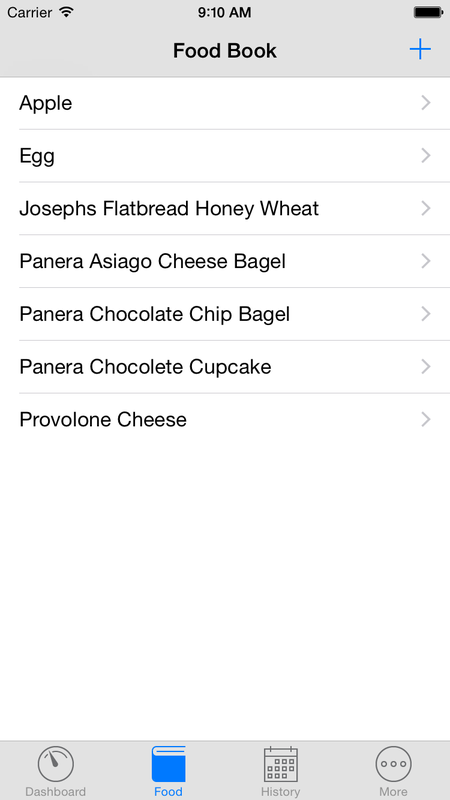 Carbs to Go is a simple yet powerful carb counting app. With Carbs to Go you are able to add in any food item and the carbs and fiber associated with that food item. The app will calculate your total and net carbs for you on a daily basis. 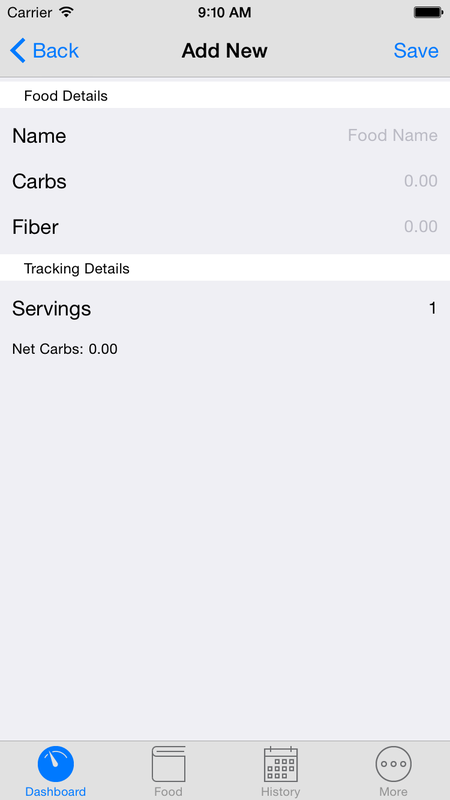 In version 1 of Carbs to Go you are able to track, view all food items entered and edit them as well as view your complete history. Version 2 will feature charts so you can see your progress with beautiful visuals. You will also be able to set a goal to track against. We hope you will enjoy Carbs to Go. The app is free but I do ask for donations if you find it useful. Social Network Integration - i.e. Share your results with FB and twitter. Tracking in Carbs to Go is a simple process. All you need to do is click the "+" button in the upper right then either select an item you've previously added to your food book or add a new item on the fly. You may use the screenshots below for reference. This is the initial screen you will be presented with when first opening the app each day. At the top you will find your carb counts. On the left is your Net Carbs and on the right is your Total Carbs. Below that you will find a list of food items you have added for the day once you have added an item. In the upper right is the "+" button allowing you to add an entry for the day. When you tap the "+" button you will be presented with your food book. Here you can either select an item you have previously added or add a new food item using the "+" button in the upper right of the screen. This screen is a stripped down version of your actual food book that is presented on the second tab. Here you will only be able to add the number of servings for a food item. 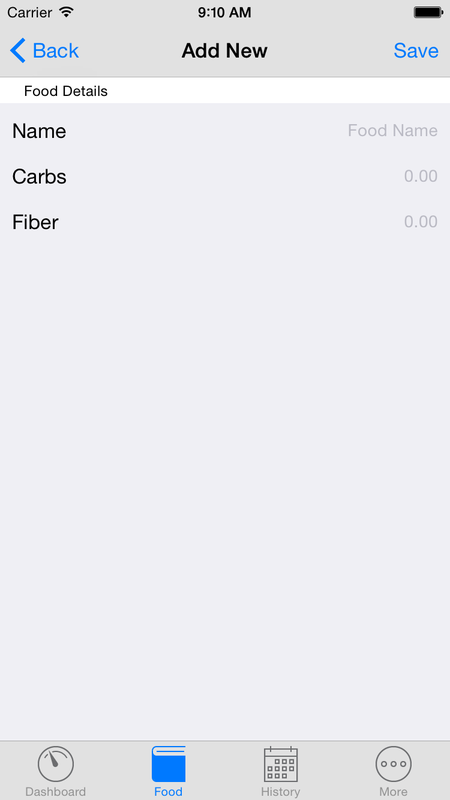 When the app is initially installed your food book will be empty. You will need to use the "+" button to add your first item. When you select an item from your food book that you have previously added you will be presented with this screen. Here you will see the name of the food item and have a place to edit the number of servings you want to track. Under the servings field you will see the total and net carbs that will be tracked for that food item and number of servings. Once you have entered the number of servings tap the "save" button at the upper right of the screen to save the entry. Once saved you will be brought back to your dashboard and see your totals automatically updated. If your food book does not have the item you want to track and you tap the "+" button you will be presented with this screen. 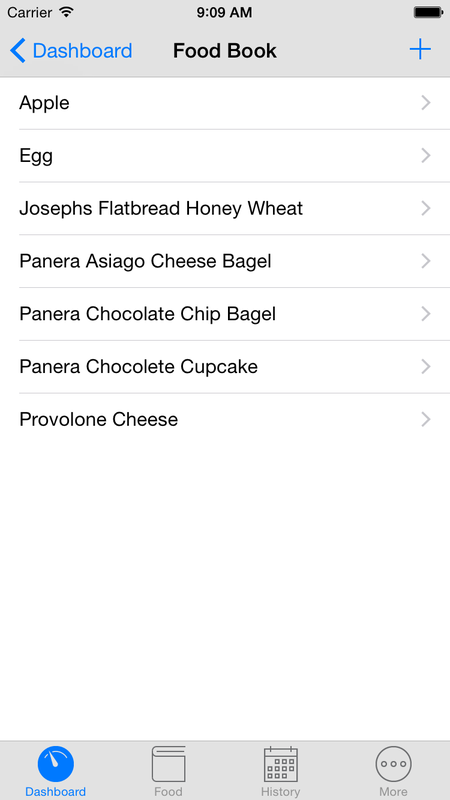 Here you will be able to add a new item into your food book, set the servings and track at the same time. You need to enter all fields (name, carbs, and fiber). 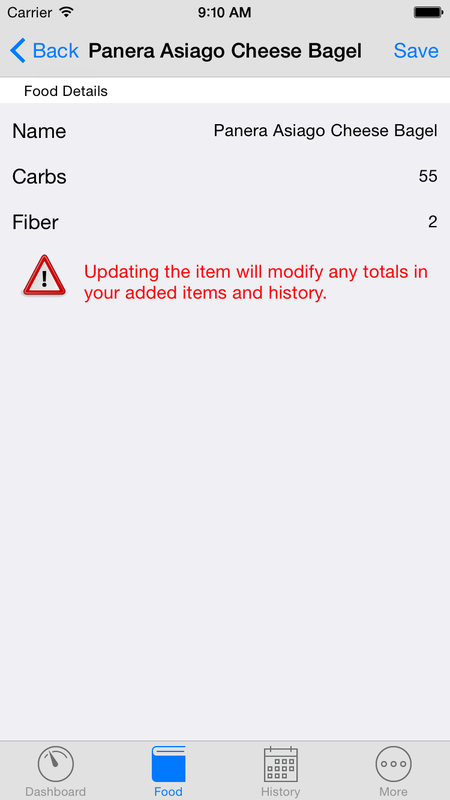 Once the food information has been entered add the number of servings you want to track. The totals will be updated below the servings field. 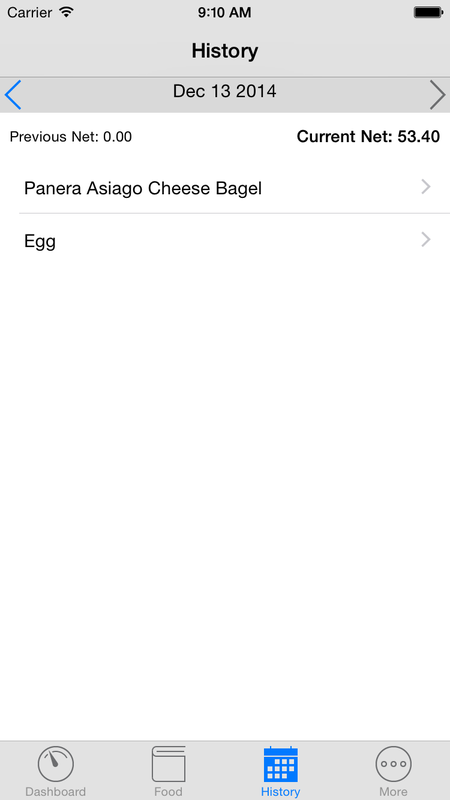 Once you are ready to track simply tap the "save" button in the upper right to commit the food item to both your food book and tracked items for the day in one action. Once saved you will be brought back to your dashboard and your totals for the day will be automatically updated. All food items you add in Carbs to Go will be kept safely in your food book. Here you can add items freely without tracking them. This will allow you to build up your food book so you are not scrambling on the fly to find out how many carbs and fiber something has. You may use the following screenshots to help navigate this section. When you select the Food Book tab you will be presented with this screen. Here you are able to freely add or edit an item. To add an item tap the "+" button in the upper right. If you need to edit an item tap the item's name. Use the Add/Edit screens to manage each food item. You can give each item a name and carb/fiber count. 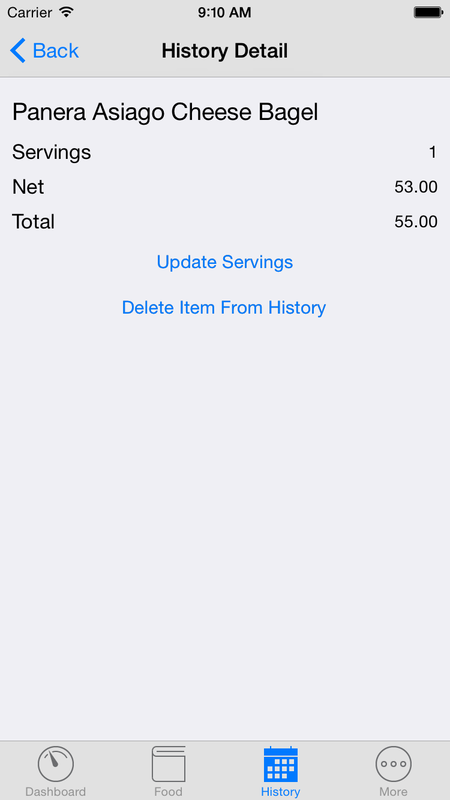 Once each is filled in simply tap the "save" button to save the item in your food book. If you edit a food item and you have previously tracked it. All tracked food items will be updated! On your history tab you will be able to view all the data you have tracked throughout the entire lifetime usage of the app. Once you tap the history tab you will be presented with the initial screen to the left. On this screen you can navigate with the arrow buttons to move forward and backwards in time. If you need to edit an item for a specific day simply tap the item's name to be brought to the edit screen. 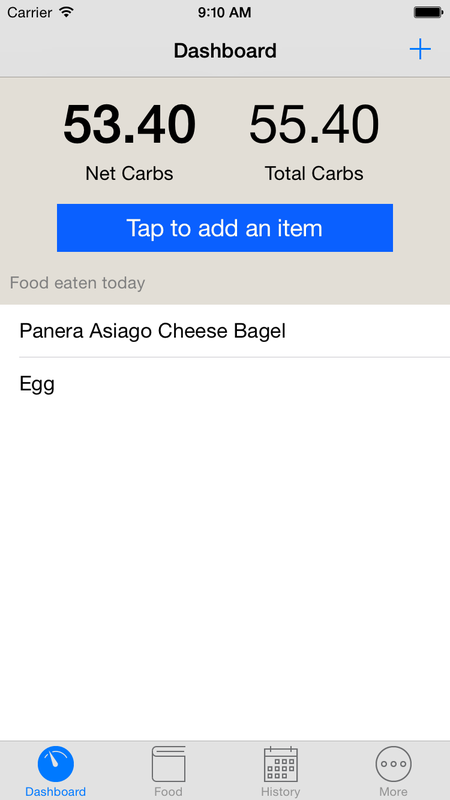 On the edit screen you can view the item's total and net carbs. You are allowed to edit the number of servings only. If you need to edit the carbs or fiber you will need to do so via the Food Book. Once you have adjusted the number of servings tap the "Update Servings" button. If you want to delete the item all together simply tap the "Delete item From History" button. Carbs to Go is provided as free software and I will never charge. However for me to continue to develop and improve the app I need to make money somehow. Instead of adding ads to the app I am going to simply ask for donations.